The Way You Do Me (Tregopak Remix) OUT NOW! 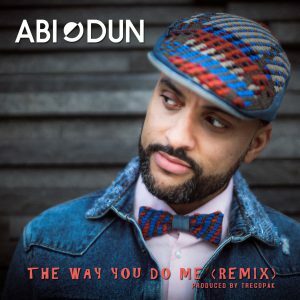 It’s a new year and a new start as Abiodun blesses the airwaves with his remix version to “The Way You Do Me”. The new single is a groovy minimalistic Electro/Afrobeats rendition of the original song from his album Break Free, which was released in October 2018. “The song is about love. About the way your partner affects you to have that loving feeling– Abiodun. The track was produced by Gert Kapo aka Tregopak and is now available on all major digital download and streaming platforms worldwide. Enjoy and spread the news. Omo Ènìyàn, meaning Human Being, is a unique and meditative song with a steady unorthodox groove. It showcases a call and response dialog between Abiodun and Òrànmíyàn, who in turn delivers an outstanding vocal performance. Influenced by its cultural roots in Yoruba tradition, the track draws a plea from the human realm to the terrestrial universe through a deep and emotional message. It is centered around a strong and repetitive bass line, which is supported by bata drum rhythms and harmonics. Two contrasting voices create a spiritual atmosphere and hereby connect with the higher forces. The video was shot spontaneously in Hamburg by the director Wiktor Flip Gacparski from Poland. The simplistic aesthetics of the visuals underline the message and the character of the song. Omo Ènìyàn charted on the iTunes World Top 200 at no. 51 and has been well received on various platforms with a consistent growing momentum of listeners around the world. The single is available on my current album Break Free. Enjoy watching! My new album Break Free is an authentic, handmade mix of global pop sounds. It fuses different musical genres like afrobeat, soul, funk, pop and rock. Break Free is made up of eleven contrasting songs – they are soulful and energetic but, at the same time, contemplative, fragile and sensitive. Previously the single and video Alarm Don Blow was released, which is now on the album as well. It is a catchy afrobeat rock song with a moral message that places it within an activist afrobeat tradition. My new single Living for the Positive was released on Fri, 13th of April, including an original video clip. The video was shot with wonderful people and a marvelous crew, supporting me on my retro-modern journey. THANK YOU! Also, the single will be part of my upcoming album Break Free, to be released in October 2018. I am grateful walking this musical path with you and surely having a journey filled with funk, rock, soul, jazz and afro-pop. Copyright AJAZCO RECORDS 2018. All rights reserved.